The 2013 Santa Fe Concorso car show. General Admission $45 online, $55 at the gate; $25 ages 13-17 and military/first responders with I.D. ; kids 12 & under no charge with a paying adult. VIP tickets, $125, include food and beverages on the club&apos;s torreon. Behind every great automobile lies a great story, and there will be no shortage of either at the 2013 Santa Fe Concorso, the Southwest’s premier event for serious collectors and more casual fans of fine automobiles, which takes place September 24–29 at the Club at Las Campanas and the Santa Fe Air Center. 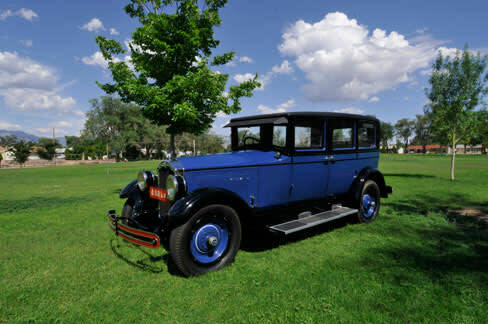 Take, for instance, a showpiece of this year’s proceedings: a 1927 Buick limousine owned by Las Cruces couple June and Joseph Lee. In 1969, an American hippie living in Nepal discovered the car, which was custom built in Canada for a Nepalese prince. Somehow, the limo found its way to San Francisco before the Lees purchased it in 1989. A three-year restoration has returned the car to its former glory, and it is now ready to shine at the Concorso. Inaugurated in 2010 by retired chief Cadillac designer Dennis Little and his wife, Beverly, the Concorso began with around 50 cars on display, and in three short years it has more than doubled its motorized eye candy. “We have around 115 cars this year,” says Michael J. Muth, Concorso treasurer, project manager, and director. “We’re starting to tap into some serious collectors. While cars are obviously the focal point, we’ll also have some vintage motorcycles on display, as well as a 19th-century wooden bicycle.” And while this year’s event, which is expected to draw some 2,000 spectators and collectors, presents some pretty spectacular rides—the sleek, 1969 General Motors Manta Ray Concept car and its predecessor, the 1961 convertible Mako Shark Concept car, among them—there are plenty of other reasons to head out to the Club at Las Campanas and the Santa Fe Air Center in late September. The Concorso offers three days of Open Road Tours between September 24 and 26, and you don’t have to be a collector to fuel up and participate. The journeys—“Turquoise Trail. Mountainair. Beyond.” (Sept. 24), “Georgia O’Keeffe. Taos High Road” (Sept. 25), and “Prairie Meets the Mountains” (Sept. 26)—are $60 per vehicle and include lunch for two, a decal, and a tour book with detailed driving directions. It’s the perfect time of year to venture out onto the winding highways of central and northern New Mexico, and take in some splendid fresh air and fall foliage. After the Wednesday and Thursday tours, participants can unwind with a happy-hour gathering at the Four Seasons Resort at Rancho Encantado. On September 27 at the Club at Las Campanas, the Santa Fe Concorso honors Denise McCluggage, a woman who not only broke the glass ceiling in the auto-racing industry in the 1950s and 1960s as a fierce professional competitor, but who also served as a founding editor, in 1958, of Autoweek magazine—for which she continues to write well into her 80s. A few of McCluggage’s original racecars will be on display, and she will be joined in a spirited conversation at the event by British racing icon Sir Stirling Moss. A VIP ticket will get you into the Friday Night Gathering at the Santa Fe Air Center, where racing royalty such as McCluggage, Moss, and Al Unser, Sr. will mingle with the crowd. Vintage racecars, World War II fighter planes, live jazz, and food and libations are also on the docket.